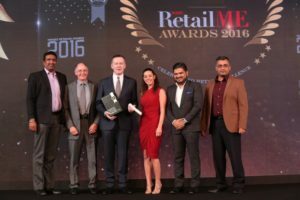 Value fashion and homeware brand, REDTAG, was the proud recipient of a prestigious retail accolade at the 2016 edition of the Annual Images Retail ME Awards, held in the Conrad Hotel – Dubai, on Tuesday, October 11th 2016. REDTAG was recognised as the “Most Admired Retailer of the Year: Affordable Fashion” under Jury Awards, winning against a very competitive set of respected value fashion retailers. redtag-named-most-admired-retailer-of-the-year-in-the-affordable-fashionReceiving the award, Ernest Hosking, Chief Executive Officer at REDTAG said: “This is a very exciting time for all of us at REDTAG, we are proud to be recognised by the Annual Images Retail ME Awards, which is certainly one of the most prestigious retail award platforms in this region. Annual Images Retail ME Awards is one of the prominent annual events in the Middle East retail calendar which recognises top performing retailers, and best retail practices in the industry and rewards excellence across a range of retail categories. Copyright © 2019 BMA News.